I keep reading online, I get so many cook-books to learn more n more! With the same purpose, I joined a foodie-group on Facebook just a week back n started interacting with fellow-foodies! Usually I don’t gel well with anyone so quickly, but this time it was totally a reverse case! Given the Indian tradition of marking everything auspicious with sweetness, I decided to pass on this recipe and the story to her…. I have a Chilled Cheesecake Recipe, which has been a favorite with my family and friends for many years. In fact, it remains a special favorite of my youngest cousin sister even today. It started its life from the, not very clearly photocopied pages, of an obscure cookbook by the name “Just Desserts” and had something to do with canned mandarins. I am sure if I dug into my treasure chest of recipes, I will find a much mangled and yellowed page somewhere to authenticate my claim. Anyway, the canned mandarins were not very nice and very soon the rest of the recipe acquired various other attributes and morphed itself into many avatars including but not limited to Pineapple, Cherry, Kiwifruit, and various other fruits to form its base and proclaim it as “their” Cheesecake. Through all its Avatars it has maintained the use of some canned juice that has been extracted and used from tinned Pineapples in Pineapple Juice. That, McVities Digestive Biscuits and full fat Philadelphia Cream Cheese have featured in its creation. A period of about 25 years has seen this “Cake” evolve and find its way into the stomachs an hearts of many of my guests. Now that I have turned a new leaf, my new way of life dictated that I translate it into a “Diabetic Friendly” version. So, I set about with much gusto to do a Strawberry version of this delectable concoction. Much to my consternation the best result I got was tasty, semi-set slush!! Of course, I promptly plunked that into the ice-cream maker and made some really yummy Cheesecake Ice cream and it was all eaten up. BUT it rankled that all I had managed in my efforts at conversion was a Cheesecake, which was rather loose in character…. I originally thought the fault lay in using sweetener and convinced myself that this must somehow interfere with the setting of the cake. But as remembered the beautifully set Mango Mousse, I could see I had to look elsewhere for my answer. I knew there was no problem with the gelatin and as I had just used it a few days ago and it worked fine. So, I set about researching every aspect of my conversion and turned to my best friend Google Kaur for answers and consultation. As usual, she thew up a zillion responses to my single query and much to my surprise I discovered that “Pineapple Juice”, specifically the fresh variety, has a major quarrel with all things gelatin and refuses to allow proper setting when used with it! So my “Oh so very healthy” and well thought out use of Fresh Pineapple Juice was no good! So now, I present to you both the recipes and leave you to make the one you want to. 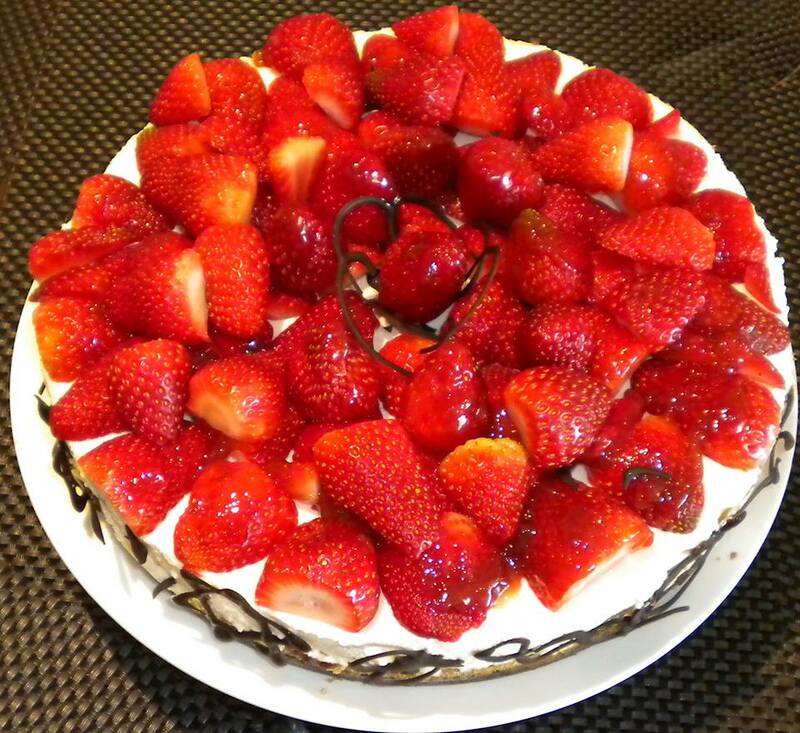 The featured picture is that of the newly added member of my Cheesecake Entourage… The Strawberry Cheesecake which was almost Lost in Translation. Lovely recipe,something i can easily make at home but one prob,i don have a loose bottomed or spring-form pan. Can anyone suggest me a substitute for that? please. "Substitute to the loose bottom pan would be either to use a transparent glass or any other dish that can hold the entire cake and serve it in the dish OR you could try it with a similar sized cake pan and make sure you line it with cooking paper in such a way that you can lift it out and place it on to your serving platter before you decorate it." ok, then i will try it. i have never made cheesecake so far.